The waterproof Pocketherm folding thermometer p250fw from Comark, it’s fast, it folds, it bleeps, it's waterproof! use this neat pocket digital thermometer for quick checks on cold holding, hot holding and ground beef. The colored LEDs will light up to indicate temperatures within HACCP limits. 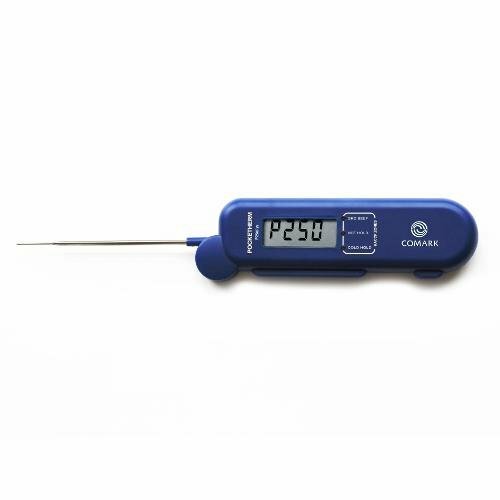 The Pocketherm folding thermometer p250fw will light up when the temperature recorded matches one of the Pre-Set HACCP zones. This makes it really quick and easy to use. If you have any questions about this product by Comark, contact us by completing and submitting the form below. If you are looking for a specif part number, please include it with your message.